Guide to Ryton Church. Click here to download a copy (Word Document 59Kbs). This includes information not found on this website. There are no real treasures of art in this church, yet its setting high above the Worfe Valley and at the end of a cul-de-sac makes it truly a place of peace and beauty. Guarding the porch are two worn old heads, one of a woman wearing a crown. Inside is a 14th century font and two ancient corbels which supported a gallery. 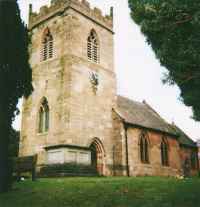 However the tower can be dated at 1710 and the chancel 1720, though most of the building was reworked in the 1870's. The 5 bells were hung in 1887 to commemorate Queen Victoria's Jubilee. A sixth bell was added in 1993. The north aisle was added in 1886 as a memorial to William Kenyon-Slaney of Hatton Grange, Shifnal, and his wife Mary. The register dates from 1659. In the chancel is an unusual memorial for a small country church. Entirely in Latin, it commemorates one Romolo Piazzani (1872-1932), described by the Assistant Keeper of the Scottish National Portrait Gallery (where his portrait hangs) as a landscape gardener, artist and (to judge by his portrait) a man about town!. We do not know how he comes to be commemorated at Ryton. The church building and the churchyard are immaculately kept. 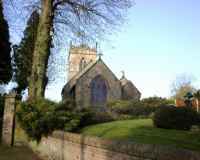 The churchyard won the Best Kept Churchyard Competition for the Shropshire part of Lichfield Diocese in 1995. For many years this church appeared to have no dedication, but in the 1980's it was discovered to be under the patronage of St. Andrew.